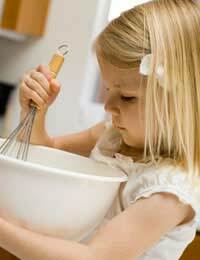 Most children enjoy cooking and there are plenty of quick, easy, sugar free recipes that are ideal for following with them. Not only are sugar free cakes, biscuits and tarts fun to bake, but they also taste delicious and will be enjoyed by all the family. Spending time together in the kitchen is a great way to have fun and it can be educational too. Not only are you giving your children valuable life skills but - by following sugar free recipes such as these - you are also teaching them about healthier living at the same time. Some sugar free recipes use artificial sweeteners instead of sugar while others use alternative substitutes. When cooking with children, however, either honey or sugar free jam is easy to use and will make tasty treats they will enjoy tucking into.It is essential that adults are present when children are following these recipes. This is not only vital when using the oven or a hob but also while hot items are cooling. A great favourite with kids both in the making and the eating, these sugar free crispy cakes are so easy to make. Here there’s also the potential to adapt your recipe as the crisped rice can be replaced or supplemented with corn flakes, pieces of biscuit, dried fruit and even nuts.Honey is used instead of sugar in this recipe and youngsters will certainly have fun spooning it in, stirring it and watching it melt. Empty the crisped rice into a large bowl. Then place the cocoa, butter and honey in a small saucepan and stir over a low heat until melted. Pour your chocolatey mixture into the bowl of crisped rice and mix well. Once thoroughly coated, spoon the mixture into cup cake cases and leave to cool. Once cooled they may be placed in the fridge to harden further. NB adults must be present at all stages of this sugar free recipe as the melted ingredients are hot. Kids will have great fun rolling out the pastry here, cutting out the tart shapes and then spooning in their sugar free jam. Strawberry jam works well but this can be substituted for any other flavour that takes their fancy. Preheat your oven to 180 deg C/350 deg F. Gently fork one tablespoon of your flour, plus your warm water, into your margarine, to create a paste. Once smooth, slowly add the rest of the flour until you have a pastry that is suitable for rolling out. Wrap the pastry ball in cling film and place in the fridge to chill for about an hour. Lightly dust a clean surface with flour then roll out the firm pastry until it is about ¼ ins thick. Cut circles with a tart cutter that are slightly larger than the holes in your tart tin. Grease your tin and press the circles in. Spoon one teaspoon of sugar free jam into each case. Bake for about seven minutes until jam is bubbling hot and pastry is golden. Remove from the oven and cool. NB Adults must supervise at all oven stages and while the jam remains hot.